Just as the Elite Four were promoting their infamous 'Free Tourny' something happened; Something big. After the violent, corrupting sounds of an explosion below, everything went dark. The surrounding world was different now, dark, twisted, upside down, and new. Pokemon never seen before were inhabiting this strange world. Trees grew on walls and lake beds rested on the ceiling. One thing is clear - Cyrus and his band of Galactics must be behind this, and they've taken the Elites prisoner. Together with their pokemon, 4 trainers must stand up to this enticing new place and save the Elites all while conquering Cyrus and find a way out of the Distortion World. Personailty: Jimmy is very trustworthy and loyal to his friends. At the same time if someone betrays him, he's not above telling them off. He'll show his fangs when he needs to. He tends to be friendly but can also be the outcast. He also has a big thing for dogs. History: Jimmy was raised in Fuschia City by a poor family. His father left when he was young and his mother was a very sickly woman. Once he was old enough, he left home in search for a better life. Being promised fame and fortune, he reluctantly joined Team Rocket as one of the Grunts. After being involved in the Silph Co. Project, he quickly forfeight his position and continued on his way, now to vindicate himself for the people he'd hurt and the lives he ruined. 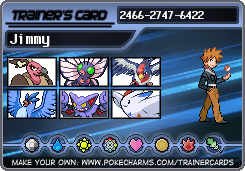 Personality: Loyal and proud, Umbreon's been by Jimmy's side since he can remember. He doesn't like to be in his pokeball, but he remains in it anyway. Personality: The newest of the 'pack', Arcanine still assumes leadership and preffers using brute force. Personality: Houndoom is known more for the fact of its cynical nature. It'd rather play with its opponenet rather than defeat it right away. Last edited by Saint_Jimmy on Sun May 10, 2009 5:04 pm, edited 1 time in total. Personailty: He only cares about himself and Dark type Pokemon. He is incredibly inteligent and well built. He doesn't understand others thinking they're ideas are better than his. He simply cannot relate to other people, but hates solitude, since he loves to show off. History: He was born in Pacifidlog town (Hoenn) to the now elite four Sidney. He later moved to Ever Grande City, when his Father was enducted into the elite four. Personality: A pesimist, who cares for others more than himself. Personality: Quick temper, obeys noone but Will. Anything Else You Wanna Add: nah. What region E4 is this? I know T. Galactic are from sinnoh, but still it could be somewhere else. Last edited by Weavile Lord on Sun May 10, 2009 7:28 pm, edited 2 times in total. History: Having been in Sinnoh for most of his life, Brandon has learned the ins and outs of the place like the back of his hand. His father is a assistant, and Brandon went with him on a trip to Johto to help with research once. There, Brandon caught his first pokemon, a Cyndaquil. It was at this point that Brandon wan't to become a trainer. A year ago Brandon started his journey to become a pokemon master. Last edited by XRader on Sun May 10, 2009 6:11 pm, edited 1 time in total. Personailty: The guy that everyone gets along with. Many people can talk to him about problems but at the same time become intoxicated with him. History: Born and raised in Goldenrod City, as with the city he lived everything was big and bright. His parents were quiet wealthy however when Clarke's mother (Sandra) fell pregnant, they got seriously worried about Clarke becoming spoilt. As a result of this Clarke grew up having to work for anything he wanted, except birthdays and christmas, with this he gained great independence so for his tenth birthday he received a pokeball and his parents wanted him to go and catch himself a pokemon. Eventually he did and obtained a Eevee, which is now Glaceon. He went on his journeys and met lots of friends including to called, May and Max. He once met a Cresselia whilst traveling in Sinnoh. Personality: A mirror image of Sam, knows when to have fun and when not to. Personality: A brilliant contest perfomer. Generally very chilled out. Personality: A tough battler, with a sweet side. Last edited by Jaguar on Thu Jun 11, 2009 12:40 pm, edited 7 times in total. That's interesting, but this isn't Lord of the Flygons, your not Clarke here. I think the last spots gonna be Crunch, he wanted Jimmy to save him a spot. XRader - Typhlosion has 1 move too many, but toher than that you're good to go. Everyone else is in! Unfortunately, I'll have to take the fourth spot, but I'll make the trip to distortion fast so Crunchy can hop in. Jimmy finally got to Plateau and saw entrance way. It was neatly decorated with balloons and streamers. He smirked. "Finally..." He clenched the fist he held his bag with and walked forward to the building. The crowd was immense. "Excuse me..." He tapped a man's shoulder. "Where do contestants go?" With no answer, he continued on his way until he was at the gate to the battlefield. He saw a couple others and the roaring crowd. Up above were the four main spectators; The Elites themselves. He was proud to be there and anxiously awaited his turn to battle. 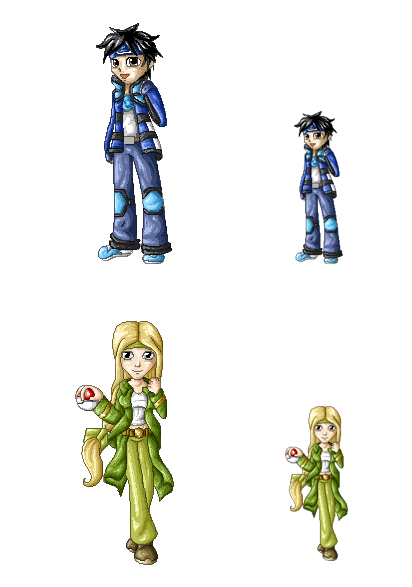 OOC:Yeah Kanto What ever, and I'll add a move later. BOC: Will was leaning on the wall, "Hey look, Fresh blood! ", he said with a smirk, ' I'm will, and your gonna hope you get eliminated before you have to face me." A absol wandered by and brushed his leg. Will pet the Absol affectionately. JImmy looked at the boy then his absol then smiled. "A dark type...I'm looking forward to your battle." He gave Will a challenging look. "I'm Jimmy, when do they start this thing?" "Well, anxious aren't we, " Will said, "It already started, but it's still the first round, and theres an opening. You are one lucky... what are you?" Will scanned the newcomer and saw 3 types of fur. Umbreon, Houndoom, and a fur he didn't know. "Nevermind, anyway, I'd high tail it to the sign up desk." OOC: are we gonna get through the first round, or is the rift coming soon? Sam walked nervously over to his seat to await his turn. He let Glaceon, seeing that Sam was nervous Glaceon tried to help him. "Oh, Glaceon that is so nice of you to help, but nervs are normal I'll be fine." Sam said stroking Glaceon's back. He looked out of the window to see the whole arena. Wow, I am up after the next battle. He pulled out his opponent card to examine it once more. It had all of his oppponents details. Name: Dallas Valley and so on but all Sam was interested in was the pokemon. Hmmm, a Kingdra, Persian and a Breloom. Inetresting. Last edited by Jaguar on Mon May 11, 2009 1:39 pm, edited 1 time in total. Could I join in, when we get there? Appearance: Tall and thin; yet surprisingly strong. ALWAYS wears overalls. Personailty: Hard-headed, but kind. Tends to try and be the hero, much to the dismay of others. History: Sebastian grew up near Fortree city; but "near" was not a very accurate word. He actually live about 20 miles into the wild, with Fortree being the nearest town. As a result, he lead a hard life, and knows a lot about survival. At the age of sixteen, his parents decided to move to Kanto; but their plane crashed and Sebastian landed on an island. There his skills were put to the test, as there were about six others who didn't know squat about survival. He met his first Pokemon, a Zigzagoon, there. When they finally got off the island, he decided to become a Pokemon trainer, going from league to league and training Pokemon. Personality: Determined to make Sebastian happy, willing to do whatever it takes. Linoone and Sebastian have saved each other's lives countless times. Personality: Has the unusual ability to speak English, not to mention Japanese and French. Very shy, and rarely speaks. Rather mysterious, never quite revealing everything she knows. Personality: Surprisingly quiet and mild-mannered for a Gyarados. Some suspect that Sebastian "tamed" him on the island, but he hasn't and won't tell anyone if this is true or how he did it if it is. For some reason, Sebastian has a deathly fear of Mightyena. It is one of the few Pokemon he refuses to catch or train. I'll be sure to wait until the Distorted World to jump in though. And yes, it is the same Sebastian. Last edited by Spiritombs Nightmare on Wed May 20, 2009 7:07 pm, edited 1 time in total. For some reason, Sebastian has a deathly fear of Snorlax. It is one of the few Pokemon he refuses to catch or train. Appearance: He’s short. Dark red messy/spiky hair with fringe over his big dark brown eyes. Black collared and buttoned up shirt, collar always stinking upwards, dark blue jeans, black boots. Bag decorated in a Pokeball fashion. Personality: He’s a hothead. He’ll try to be serious and whatnot but he’s way too childish and his attention span is very little. Sometimes stubborn and impolite, but in the thick of things he’s quite reliable to do good by people. Don’t call him small or he will get aggressive. History: Originally born and bred on the Seven Islands, Leo lived with his mum and dad. Being bullied for his height, he sought off and found a famous breeder of Pokemon. Training the hatched Pokemon and becoming the best Pokemon Trainer in the area, he kicked all their arses in his revenge, whether they had a Pokemon to battle back or not. 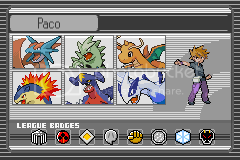 Making a thing of it, he decided to go ahead and obtain all the badges on the quest to become Champion, the best trainer there ever was. Personality: This Pikachu is a quiet one. Hardly ever talks until a command is ordered by Leo. An example of this would be when Leo is commented on his size; “SPARKY VOLT ATTACK DAT MOFO!! !” “PIKA-----CHUUUUUUUUUUU!! !” and cut. The Pikachu is smaller and fluffier than regular Pikachu. Famous for giving Leo odd looks as he does something stupid. Personality: This Mudkip is known for his outgoing nature. Wearing a strange black bandana from birth, he still bares it for keepsake. It was passed down to generation to generation from a long line of Mudkips. Muddy is actually named after his great, great, great, great, great, great, grandpa; Muddy the first. Leo and Muddy are much alike as they get into a lot of trouble together. Best friends with Sparky. Sam, sat there staring at the clocking watching the seconds go by. Only 2 minuets to go now. "Sam Rosenight and Dallas Valley, make your way to the stage you battle is beginning in 1 minuet." A tournament worker said. The pair walked to the stage door, they shook hands and went down their separate paths. 30 seconds and your on. "Have your first pokemon ready. Set...go!" The same worker said. Sam felt an immense rush of adrenaline. He leaped onto the stage when his green light flashed. Dallas had already released his Persian, " Lopunny! Battle show!" The battle had begun. "Persian, Dark Pulse!" Dallas comanded. (Dallas looks at bit like this http://fc02.deviantart.com/fs32/f/2008/ ... f_Link.png The top one) Persian launched a powerful Dark Pulse heading straight for Lopuuny. "Block it with Dizzy Punch!" Sam ordered. The crowd were stunned, block? Not dodge. Lopunny headed straight for the Dark Pulse. She crashed into the pulse completely destroying it. Going straight for Persian, ears first. Crashed straight into Persian. Throwing it straight into the arena wall. Persian gotten up have taken serious damage. Crap, the special attack did not work. I must try a psychical one. "Try, Slash." Dallas said. Persians speed was incredible, landing a direct attack on Lopunny. Lopuuny struck back fast with a Sky Uppercut KOing Persian. Dallas' face sunk. They both recalled their pokemon to release their next pokemon. Sam rushed out to the stage once he heard the tremor. Lots of other trainers gathered there, where a bright light shone. Well that was... unexpected. Anyway, time to begin! Plus, time to introduce my special "extra". Brandon watched as the scene unfolded before him, but he did nothing. The reason? He needed to find a song epic enough for this moment on his Pokepod. He finally decided on Trial by Fire by Immediate music, and had it loop for a while. He then slowly walked over to the stage, and to the bliding light that shone from it. Right now, this is only to give you an idea what I want to be thought of when reading my posts, but don't worry, I have a plan for what this will be later. 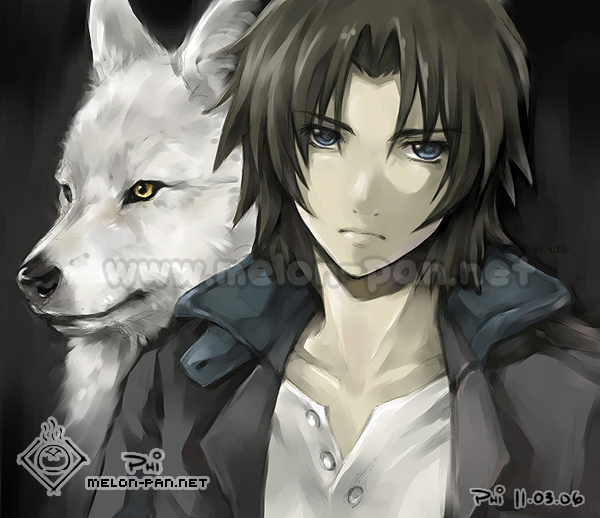 Appearance: Brown hair in a lazy spike stlye, looks like his "brother" Lance. Wears a polo shirt and jeans, sometimes a black suit. He is known to like the finer things in life, such as fancy food, hotels and suits. History: Jet was born and raised in Blackthorn City. His nextdoor neighbor was the Dragon Gym Leader Claire. When he was ten, he met Lance at the Gym and became like a brother to him. Lance gave Jet a Bagon as a birhtday present. Jet would train with Lance and became a contender for the Elite Four. Last edited by paco25_007 on Tue May 12, 2009 3:52 pm, edited 1 time in total. Leo stood up in a gasp from the terrified crowd, Sparky on his shoulder growling angrily at the mysterious person that appeared up on stage with the rest of the Elites. Leo clenched his fist in front of him, "Something must be up! Sparky, hold on!" he shouted, taking the Pikachu under his arm and running through the crowd. He tried his best to avoid being trampled on and jumped from the stampede with a triumphant yell. He stumbled and rolled, quickly recovering onto his feet. Leo witnessed a few other trainers running to the rescue, all taller than him... But damn it! He needed to help out. It was just the right thing to do! He ran together with them up onto the stage, and then, the light. "Ahh!" it blinded him and Sparky screamed, "Pikaaaaa!!!" Leo held onto Pikachu as tight as he could as he felt himself being swallowed by an incredible force. As with Crunchy; disregard this post if we aren't supposed to be there. Sebastian ran towards the Elite's chairs as fast as his feet would carry him. He came there, and discovered that the Elites were gone. There was a flash of light, and Sebastian was sucked into it as the world then went dark. Jimmy had just woken up shivering. He looked around, startled. He felt like his insides were on fire and his outsides were frozen solid. It took him a bit for his body to adjust. Once back to his normal self, he walked around. "Well...this definitely isn't the Plateau, I know that much." Without realizing, he walked into a tree a lept back. He tilted his head and looked at the thing. It jotted out of a wall yet still seemed stiff; No hanging branches, no tilted stem. It seemed gravity had no effect here...yet Jimmy still stayed grounded. He walked further down and found a boy laying unconcious a few yards ahead of him. He looked pretty short and had messy, dark red hair. He rushed toward the boy and knelt down beside him. He's alive...good... He shook him lightly, trying to wake him. "Hey, kid, are you alright? Wake up." This is where having the Pokepod get's important for me. Brandon awoke, face down, in a dark world. Music switched from song to song in his ears. I must have acquired a glitch when I entered the light, he thought. He reached to his ears to pull out his earbuds. They weren't there. He searched around, to find his Pokepod about a meter away. Brandon walked over and examined the Pokepod. It didn't look much different, except now it had an orange tint to it, and the screen was flashing through the titles of many different songs. "What the f..." Brandon began. At this point, the Pokepod stopped making any sounds. It now showed a face on the screen, just two eyes and a wierd smile. Suddenly, the Pokepod began "talk" to Brandon, if that's what you could call it, seeing as it was taking words from different songs and splicing them into sentences that didn't sound normal, (Think how Bumblebee talked in Transformers). "Who the are you?" it asked. "I'm Brandon, and if you don't mind me asking, who on Earth are you?" Brandon replied. "On Earth, I'm just a little prankster. Oh, but we're not on Earth anymore. No, we're somewhere far more amazing." "Then how the are we supposed to get out?" "How should I know, I'm just as lost as you." At this point, the Pod began to spew out some words that Brandon couldn't understand. Just great, Brandon thought, It found my Korean songs. All 105 of them. This is going to turn out just great. "Well, we might as well try and find everyone else, there's strength in numbers," Brandon said as he carried away the Pod, who was still spewing out Korean words. I know it's crazy, but I just wanted to add a little twist before we start. 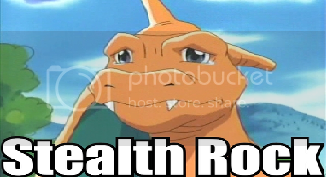 I don't plan on using the Rotom to fighting. I can delete this post if it's to crazy.